I develop and present a variety of internal/external training materials for employees, agencies, and governmental officials. Along with training, the creation of standard operating procedures (SOPs) to create efficiencies within internal departments, product launch plans, and a variety of other revenue generating, and educational programs. *Case Studies are written for information confidentiality purposes. The Objective: Revenue continued to suffer from prior year. 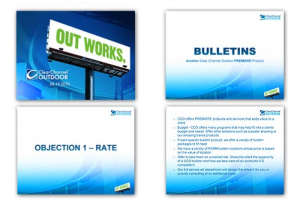 Account Executives, seasoned and new, needed a bulletin training and refresher course on the benefits and features of why CCO sells a premium bulletin product, program, and offerings. The Solution: By having an open forum and allowing the Account Executives to speak about the drawbacks and client objections to bulletins, I created and facilitated a training program addressing client concerns, features and benefits, and price points. With this, I developed a 10 for 20 Bulletin sales package and efficiencies for local and national clients. The End Result: By using internal training and sales packages, the branch was able to create occupancy within the plant, increase revenue, and by the next quarter increase revenue 5.5% over prior year. We reached Rate attainment and occupancy as a branch. There after, rate increases on bulletin products were inputed on a weekly basis. The Objective: Revenue continued to suffer from prior year. Account Executives needed a posting training and refresher course on the benefits and features of why CCO sells general market posting products, programs, and offerings. The End Result: With the incentive and “Spring Fever” promotion, the Account Executives were able to obtain the $25,000 in posting revenue (plus some) and the Vice President of Sales dressed up and shook his tail thing! The entertainment was worth it and he remains an excellent sport! The Objective: Transit revenue suffered over prior year into the first quarter. We just received the RFP from our transit partner (IndyGo) and loomed concern that our transit partner felt buyer’s remorse. Our internal Account Executives needed a transit refresher course on the benefits, features and products of why CCO sells transit products, programs, and offerings. The Solution: First we met with our transit partner and determined their needs analysis and invited them to come help us present to the Account Executives. I worked with our transit rep to give new life to an older Open Door Paratransit product, updating the media kit with new ridership numbers and demographics, and developed a new product line through corporate we could sell in the Indianapolis Market. Our transit rep and I worked together in refreshing the transit route lines, maps and general information in the transit outdoor media kit. Behind the scenes, our transit partner was in the works of launching fully re-designed metro buses and added a hybrid “Green” eco-friendly bus line. 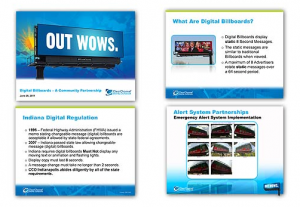 With all of the secrecy in the works, we developed a transit training presentation that would WOW any advertiser. While working on the presentation, I developed new sales packages with updated price points to start generating occupancy within the bus fleet. The End Result: The new transit launch training was a complete success! With all of the new sales tools, buses, and product lines, we built excitement for our transit partner and brought new life into our Account Executives on our transit line importance. By the end of the next quarter, transit was BOOMING! Our branch was up 300% over prior year in revenue! 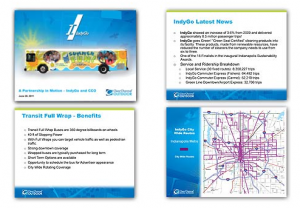 The Account Executives sold the re-invented Open Door Paratransit contract for 52-weeks and our transit printing and installation vendor created a prototype of our new product line, at no cost, for the Indianapolis Colts to ride the routes as a living promotion. Price points increased substantially due to the demand of our transit product line. (Record to date, we do not have enough fleet inventory for the transit products demand). The training program, then moved to agency presentation and training development. The Objective: Due to the Indiana Marion County regulations on digital products, our digital bulletin deployment and conversions only took place in surrounding counties within the Indianapolis Metro Market. The Solution: First, I went to the ultimate source, the Corporate V.P. of Digital and Real Estate Development. I took an old corporate digital real estate presentation, rebranded it, updated images and copy, developed it into a marketing piece, and re-positioned it so all local CCO markets trying to fight the same political battle of getting digital conversions could use it. The national presentation deck adjusts to fit all local market needs based on their regulations. The End Result: I worked with local lobbyists, state officials, and private sectors in changing the regulations for digital conversions. After presenting the case for digital builds, new areas of the Indianapolis Metro are in the works of digital development and conversions. The Objective: For years, media buyers, agencies and clients bought outdoor products as a small piece of their media budgets. The primary concern with the agency buys, related to the concept that outdoor had a different selling metrics system and could not easily integrate in the CPP/CPM and GRP level buying structure. The Solution: After a year and a half of (CCO) updates, internal corporate and external Traffic Audit Bureau (TAB) marketing/account executive training, and Eyes on Impression developments, I heard during conference call the “KISS” method. Teach them how outdoor advertising was bought before because the buyers didn’t understand, now teach them the new metrics system that fits seamlessly with how other media types are bought on a TRP/GRP level. I created a “NEW” Eyes On Impression training and education presentation for the Indianapolis Market. As opposed to trying to teach agencies numbers, metrics and marketing lingo, I created an educational piece that even the smallest business client to the biggest agency buyer could understand. I stepped back and dug down into my media buying roots. The End Result: After giving the first educational “Lunch and Learn” presentation to our largest agency, the concept took off. We completed multiple “lunch and learn” programs to media buyers and drilling down to local clients. Overall revenue increased by the ability to compete with other media on GRP demographical buys, reach and frequency, geo-targeting and CPP/CPM. 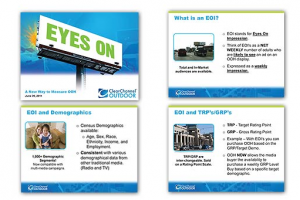 CCO Indianapolis got loaded down with EOI requests from media buyers to add outdoor advertising as part of their media mix. 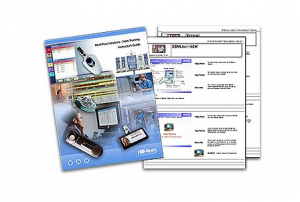 The Objective: Hill-Rom needed to create an instructor’s manual for their new ComLinx Nursing Communication LAN product. The instructors needed the capabilities to adjust and print the facilitator and student manuals on-site during training sessions within a universal software program, as well as, have a PowerPoint Presentation to use with the manual. The Solution: I created a student PowerPoint Presentation with the research and data on the new ComLinx Software system. By creating two separate training manuals within the design layout functions of PowerPoint, I effectively developed a facilitator version with notes and a student version with the clear field notes and produced a design layout that could easily and readily be updateable and printed onsite within a universal software program. The End Result: The ComLinx training program succeeded. Hill-Rom increased sales revenue on the new ComLinx software LAN system and today nation-wide user implementation in hospitals and clinical settings.